Yesterday the bipartisan group of senators known as the “Gang of 8″ released their comprehensive immigration reform bill that will allow for undocumented immigrants to apply for permanent legal status within 10 years and eventually for U.S. citizenship. The bill is a major milestone in the change needed in our immigration system and a testament to our American values of fairness and equality. Nonetheless, issues remain. We cannot ignore the serious threats to civil and human rights that are inherent in the call for new border triggers and continued unaccountable spending on border enforcement. Immigration reform may finally be within reach. It’s now time for enforcement reform. The debate on immigration reform is always met with demands for an air-tight seal on the border. While immigration reform has failed multiple times, every recent demand for ramped up border enforcement has been met. The Senate bill plans to spend $3 billion more in an already bloated $11 billion budget for border enforcement intended for even more fencing, military technology and agents between ports of entry. This is misguided and irresponsible. The rapid expansion of military technology and the number of federal agents at the border has created an environment of abuse against border residents where agencies spend and act without consequences and without oversight. Consider that in 2007 lawmakers from both parties, led by Republicans, asked for drones, radar and camera towers, miles of fencing and more deportations. Not only have these demands been met, many of them have been exceeded. When they asked for 4 drones to scan the border in 2007, they got 10. When they asked for 21,000 agents on the ground, they got 22,000. In fact, President Barack Obama has deported almost 2 million people, breaking a record previously held by Dwight Eisenhower. This administration has brought the U.S. to a high water mark on spending at the border, with a jaw-dropping $11 billion spent last year alone. Yet sadly, protecting the human rights of border crossers remains elusive. We need to ensure that our American values are incorporated in the midst of this rapid immigration enforcement expansion. We hold dear our values of checks, balances, and accountability. It is a part of our political ethos that our government and our officials must answer to “We the People” for their policies and their actions. This value is what was at the root of both the Tea Party and Occupy movements. Although the targets of their outrage were different, their emotion was the same: You answer to us. This is exactly is what is missing at the border. The U.S. enforcement strategy at the border is not lacking in manpower or money. In fact, Customs and Border Patrol (CBP) is the nation’s single largest law enforcement agency. But it operates without a single independent oversight mechanism. This wouldn’t fly for any other federal agency, but it is the natural consequence of a strategy of unmitigated escalation for border enforcement. 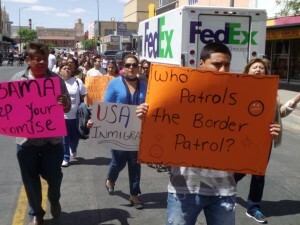 Recent polling commissioned by the Campaign for Accountable, Moral and Balanced Immigration Overhaul (CAMBIO) shows that the vast majority of Americans want border enforcement that is targeted to real threats like drug smugglers and human traffickers, instead of using our precious resources to go after people who want to work and raise a family in the U.S. An even bigger majority, 95 percent, want to make sure that border agents are accountable. That’s why immigration reform isn’t enough. The U.S., particularly those living near the border, needs enforcement reform. A system for bringing the people who live and work at the border to the table is the way forward. They have a personal stake in ensuring not only border security, but human security at the border. They deserve a voice. They are community members, business owners, local law enforcement, elected officials, religious leaders, academics and others who would be able to oversee the impacts of border security programs and policies. A group of such individuals would assess how border enforcement impacts human and civil rights and whether the policies are fiscally responsible. It would include the northern and southern borders and have the ability to make recommendations to Congress and the DHS secretary — as well as the president — for how to improve border operations. That is why the Border Network for Human Rights advocated for a “Border Oversight Task Force.” In fact, some iteration of this task force has been in the three latest attempts at immigration reform. But when the bills failed, they took this badly needed accountability body with them. The Border Oversight Task Force is a much-needed accountability mechanism; it will ensure that the American values of civil rights, transparency, responsible spending and accountability are brought to our border enforcement system. Immigration reform must address the lack of oversight and accountability in the current border enforcement system. No matter what the “Gang of 8″ proposed, the people deserve to know what programs their tax dollars are supporting at the border and how those programs are impacting the rights and lives of the people who live there.